This is a re-blog from May. Only this time for those who dare read all the way through to the end there is a feast for the mind. Dan Brown’s Inferno was released this week. I picked it up not because I think of Brown as a wonderful writer (I don’t) but because I am a huge fan of Dante’s. I first read the Divine Comedy as a freshman in college. Even though I was only 18, his opening line spoke to me. What college freshman doesn’t feel lost? Over the years I never got over my experience with the Italian poet’s haunting tale of sorrow and redemption. I have a small collection of translations; so far I’ve read seven. 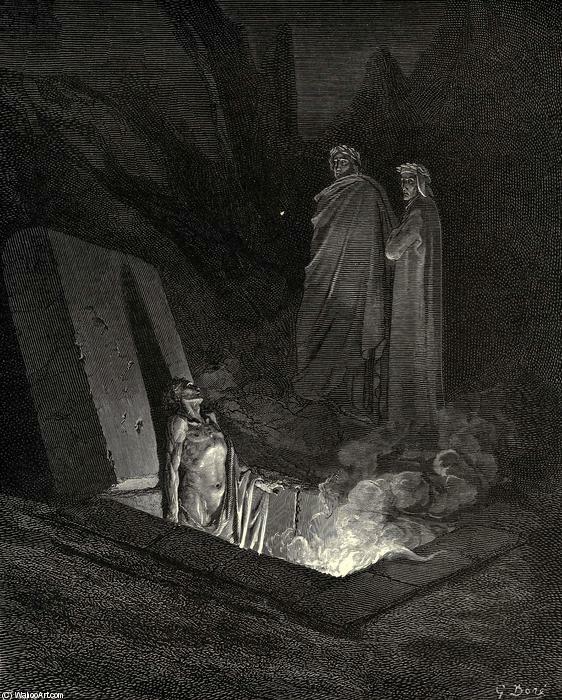 Gustave Dore’s etchings of Dante’s poem are some of my favorite pieces of artwork. So I thought this would be an opportune time to do another series of lists. Dante Alighieri was an Italian poet and philosopher best known for the epic poem The Divine Comedy. The poem is broken into three “books or sections,” each representing one of the three tiers of the Christian afterlife: purgatory, heaven, and hell. This poem is considered the greatest work of Italian literature. Dante is thought of as the father of modern Italian. The poem is labeled a ‘comedy” because he penned it in the “low” Italian language, not the “high” Latin language as was the norm of the day. Works penned in the language of the masses were considered “comedies”. Dante was the first to pen a serious poem in a native language. 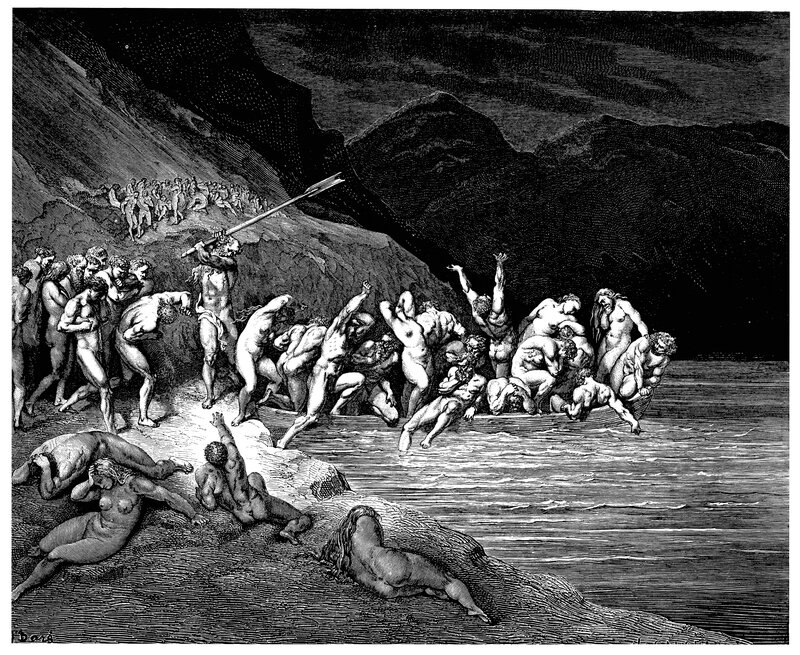 The Divine Comedy is an allegory of human life presented as a visionary trip through the Christian afterlife, written as a warning to a corrupt society to steer itself to the path of righteousness: “to remove those living in this life from the state of misery, and lead them to the state of felicity.” The Roman poet Virgil guides Dante through hell and purgatory. Virgil, being condemned to purgatory cannot guide Dante in heaven so Dante’s life long love interest, Beatrice guides him through heaven. Who the heck is Beatrice anyway? Beatrice died in 1290 at the age of 25. Dante never did forget her. His first work “La Vita Nouva (The New Life) is a series of love poems to an unnamed “Blessed Lady”. In the Divine Comedy, Beatrice is the named blessed lady who takes pity on Dante and begs Virgil to help him. It is through Beatrice that God finally graces Dante. Why did Dante write the poem? The writing of The Comedy was greatly influenced by the politics of late-thirteenth-century Florence. The struggle for power in Florence was a reflection of a crisis that affected all of Italy, and, in fact, most of Europe, from the twelfth century to the fourteenth century—the struggle between church and state for temporal authority. The main representative of the church was the pope, while the main representative of the state was the Holy Roman Emperor. The last truly powerful Holy Roman Emperor, Frederick II, died in 1250, and by Dante’s time, the Guelphs were in power in Florence. By 1290, however, the Guelphs had divided into two factions: the Whites (Dante’s party), who supported the independence of Florence from strict papal control, and the Blacks, who were willing to work with the pope in order to restore their power. Under the direction of Pope Boniface VIII, the Blacks gained control of Florence in 1301. Dante, as a visible and influential leader of the Whites, was exiled within a year. The pope, as well as a multitude of other characters from Florentine politics, has a place in the Hell that Dante depicts in Inferno—and not a pleasant one. * From Sparksnotes. There are nine levels of hell: Limbo- virtuous Pagans.. Lascivious. Gluttons. Avaricious and Spendthrifts. Wrathful. Heretics. Violent. Fraudulent. Treacherous. Satan is found in the ninth circle, eating traitors. Hell is not always hot. In the poem Hell has a river of boiling blood for people guilty of bloodshed, tombs of fire for heretics, and a desert of fire for the blasphemers, usurers and homosexuals. The lustful are blown about by strong winds, while the gluttons in are punished in sleet and muck. In the lowest circle Satan himself is waist high encased in ice. 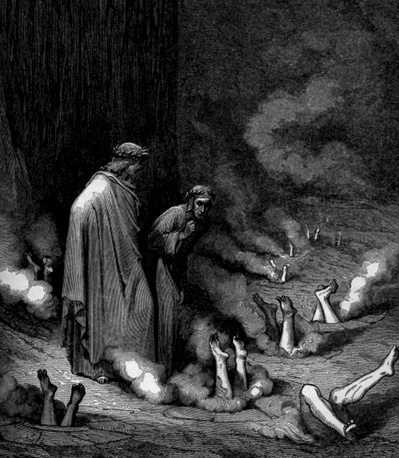 Hell is full of real people Dante knew plus some famous Greeks, Romans and Biblical figures along with mythical creatures. Each shade that Dante meets and questions is named as someone he knows. The early readers of Dante would have been familiar with most, if not all of them. The difficulty for modern readers is that these people were contemporaries of Dante. It is the punishment not the person that we need to concern ourselves with. Hell is gated. The most famous of all Dante’s quotes “Abandon all hope, all ye who enter here”, is found above the gate. There are three rivers and one lake in Hell: 1. 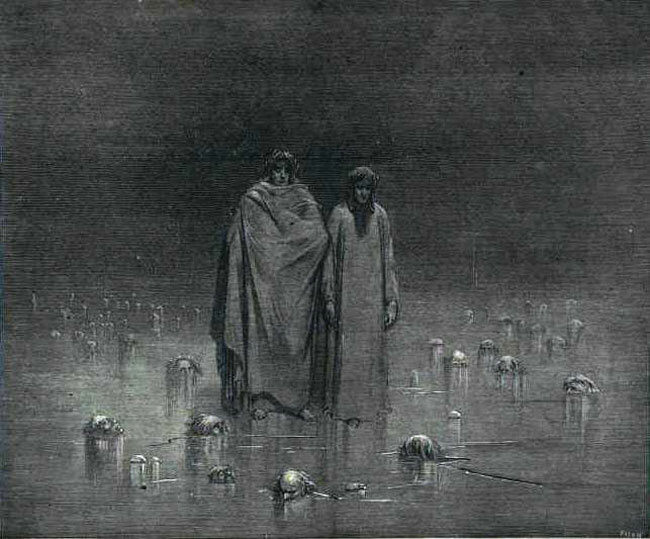 Acheron on which all souls have to cross into Hell. 2. 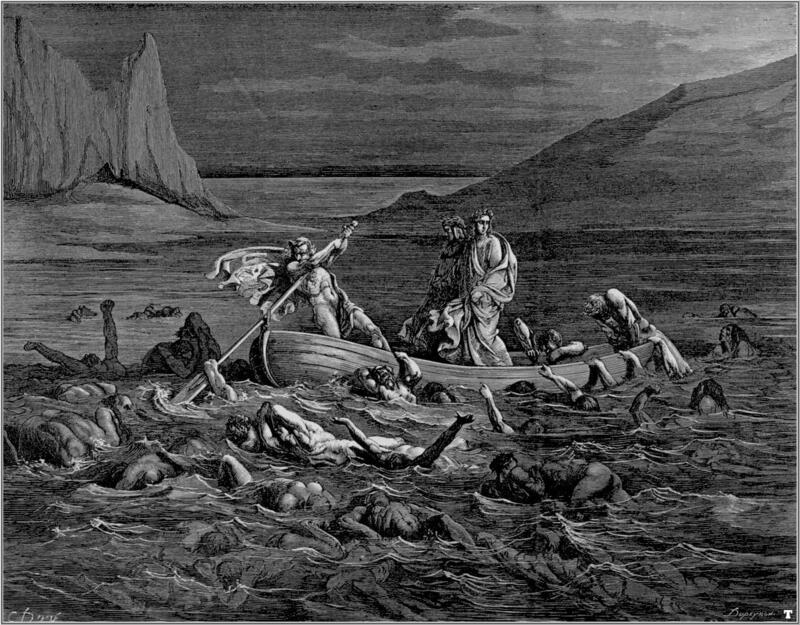 Styx in which the wrathful souls are submerged 3.Phlegethon the river of blood in which those violent against others are boiling. 4. Cocytus: the iced lake of the lower level where we find Satan frozen in the middle. If you have never had the nerve to pick up the poem I would suggest you start with Bang’s as hers is written in modern English and she peppers the poem with pop culture references. It may not be “high brow” but at least you will have a good understanding of the poem’s meaning. You have done a great service for me. Never having read ‘The Divine Comedy’, but often making reference to it, I can now relax knowing more than I ever did. I’m going to take your advise and pick up Bang’s version. Thanks Bart, I’m so glad you liked it. I think Bang’s is a terrific start, though don’t stop with her. Longfellow should be next as it fairly simple once you understand the story. Pinsky’s is the most poetic of my picks and takes a while to absorb. Thanks! I’m glad you liked it. Thanks for stopping by. Love your blog!